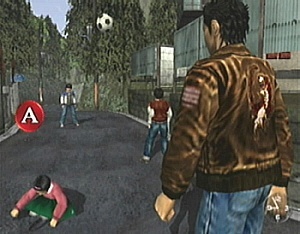 When Shenmue introduced Quick Time Events seven years ago, it didn't look like the beginning of a trend. Synchronizing button presses with onscreen cues didn't exactly catch on, maybe because gamers weren't impressed by the prominent on-screen depiction of controller buttons in the middle of their cut scenes. It took two 2005 blockbuster titles, Resident Evil 4 and God of War II, to bring such mechanics into the limelight. In 2006, Tomb Raider: Legend followed suit, and now QTEs will feature prominently in the upcoming Heavenly Sword and The Bourne Conspiracy. It's unfortunate that cluttering up action scenes with controller button images has become a selling point. I like the way God of War lets me brutally pluck out Cyclops' eyes. I don't like the way it sticks twirling 3-D representations of the DualShock's orange circle button on the screen as I do this. By the same token, when I'm yanking a gigantic hydra head around with Kratos' awesome chainblades, I don't want huge green triangles blocking my view of the action. Giant DualShock buttons have no place in Greek mythology. I suppose I shouldn't be too surprised to see Wii titles following suit, considering Nintendo's focus on making games easier to play. 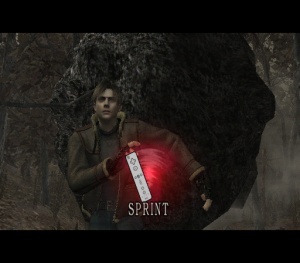 The recently Wii-retooled version of Resident Evil 4 is perhaps the worst offender. While the original release peppered its cuts cenes with flashing GameCube controller buttons, the new and improved version has the audacity to throw animated images of the entire remote onto the screen; there it is, glowing red and waggling obscenely in the middle of my epic boss battle. While Leon Kennedy courageously hacks the parasitic growth protruding from El Gigante's spine, the game makes certain I don't forget I'm sitting on the couch, gesticulating like an idiot with my controller. So much for immersion. I get what developers are trying to do here, and I'm not opposed to the underlying principle. Using a bit of player interaction to spice up cinematic moments usually is a noble cause. I think there's a better way to go about it, though. Prince of Persia: The Two Thrones, for example, was on the right track with its speed kill system, which used subtle onscreen indicators to prompt player actions. In typical combat scenarios, a shimmering effect would appear around the edges of the screen when a stealth attack became possible. Pressing a single button would trigger a stylish sequence of animations, culminating in a single flash of the Prince's dagger. Timing a button press to the flash of the dagger enabled a perfect stealth kill. The developers expanded the system for boss fights, which synchronized a series of button presses and dagger flashes to trigger impressive attacks. The system worked, because it combined elaborate animated sequences with player input without resorting to dumb, intrusive visual indicators. Instead of watching obnoxious buttons flash across the screen, the player could keep an eye on the spectacle and respond solely to the rhythm of the action and the telltale gleam of the Prince's weapon.